Happy Homemaker Me: Pinterest Party Link Up! Welcome to my first Pinterest Party! If you have a project, recipe, organization tip, or anything else that you've pinned on Pinterest and are itching to try it, go ahead and make it, post it, and link up! Please add this button to the bottom of your post so that others know to come here and check this party out! So, when I saw this adorable little plushie on Pinterest, I knew I wanted to make one for our sweet Kayleigh. It's soft, it's cute, light and easy to hold, and it has taggies! I went to JoAnn in search of soft, plush fabric. I fell in love with the chenille and minky they had by the bolt, but it was $15 a yard. I headed to the remnants section, and found soft green terry. Best part? All the remnants were 50% off! I spent about $1 on enough fabric to make 15 of these little guys. 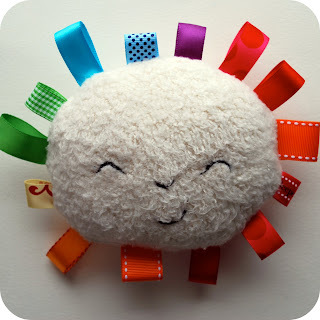 Kelly's plushie tutorial comes with a full PDF download. It has two pages of instructions, and two templates to choose from. So helpful! I used waste canvas to help me keep it all straight. That stuff is handy! I used ribbons from my stash, cut them different lengths, and followed Kelly's tutorial to sew it all together. And please show some blogger love by visiting other links and leaving comments. Let's encourage one another and make some new friends! So cute! Mackenzie loves her taggie blanket, she even sleeps with it. Absolutely adorable! I wish I could link up but the crafting bug is not biting me lately. It's Almost Time for the Pinterest Party!